Axel Loves Playing With Harley! Axel is doing very well. Harley and him love to play and get along well. We did not change his name, we like the name he was given. Axel has taken well to our family. We are currently working on potty training him. He’s had a few accidents in the house but it’s a learning process. We have our trainer coming over on Sunday to help us. 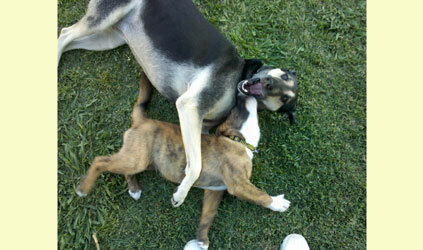 I attached a picture of Axel and Harley playing in our back yard. I will get a picture of my family with the dogs together and send you a copy. Thanks again for your help. We love Axel and feel he was a great pick for our family.